A typical household notebook of the nineteenth century, "Recipes. . . and Observations, etc." 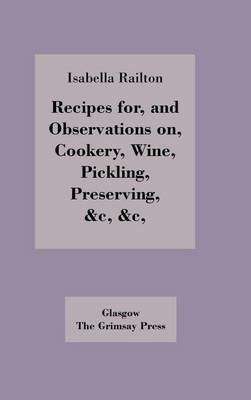 survives as an octavo soft-covered notebook begun in 1815 by Isabella Railton, apparently by inviting her friends to contribute recipes in their own style and hand. After her early death in 1823, it appears to have been continued on the same principles by her daughter, also called Isabella. The few dated entries show a compilation period of over fifty years.